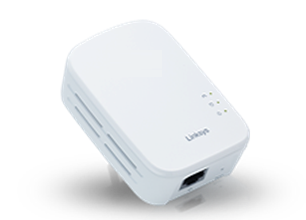 The PLE500 is a Powerline Gigabit Ethernet adapter that has one (1) Ethernet port. One of these devices is typically used in a Powerline network to connect your network’s router to the household wiring. You can also use one of these in any room to connect one (1) wired Ethernet device to your Powerline network. For a video on Powerline adapters, click here. NOTE: You can use two (2) or more Powerline adapters to set up a Powerline network. Power (Green) – lights up when the Powerline adapter is powered ON. Ethernet (Green) – lights up when a wired network device is connected to Ethernet (network) port of the Powerline device. The LED flashes to indicate network activity. Powerline (Green) – lights up when the adapter is connected to the Powerline network. The LED flashes to indicate network activity. HomePlug Simple Connect Button - configures advanced security (the network password) for your Powerline network. Reset – Restores your Powerline adapter to factory defaults. To do this, press and hold the Reset button for at least 10 seconds using a pin or a pointed object. Ethernet - connects a computer or another networking device. Setting up a Powerline network is an option to extend your home network. Click on the links below to know more about Linksys Powerline adapters and Powerline networking.